Inventory Asset Account – An asset account of type INVENTORY to track the value of stock on hand. Inventory Adjustment Account – An account to track the value of inventory adjustments. Cost of Goods Sold Account – An expense account to track the cost of goods sold. You may want to have more than one inventory asset account if you want to distinguish between different stock lines on your balance sheet. You can check this using the accounts endpoint and create new accounts if required. Once you know the Inventory Asset Account and Cost of Goods Sold Account you can create the inventory items in Xero (if they haven’t been created yet). See our documentation on the Items endpoint for details how to create and update tracked items. Once the inventory items are created in Xero you may need to adjust the quantity and value of each item. You can do this using an inventory adjustment. You may also need to do inventory adjustments periodically to increase/decrease quantity or revalue items (e.g. after a stocktake). 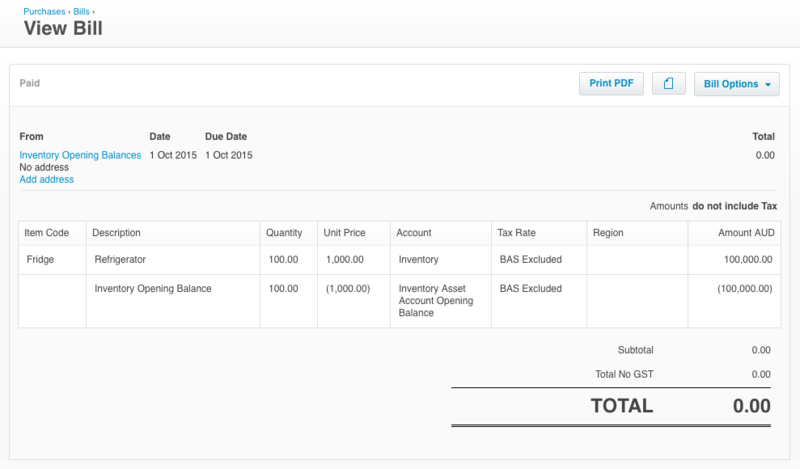 You can increase quantity on hand by creating a zero-total purchase (ACCPAY) invoice using the Invoices endpoint. For each inventory item you will need to create two line items; one to recognise the increase in the inventory asset (and increase the quantity on hand) and a second to recognise the the inventory adjustment. The inventory adjustment line will have a negative unit price so the two lines sum to zero. Here’s an example. Imagine I’m adding 2 refrigerators at $1000 each. My inventory asset account is 630 and inventory adjustment account is 401. Decreasing quantity of hand is the reverse of an increase. The only difference is using a credit note of type to ACCPAYCREDIT (rather than an invoice). The following example would decrease the quantity on hand by 2. Perform a GET on the item to retrieve the quantity on hand and total cost pool. Divide the total cost pool by the quantity on hand to get the average cost for the item. Perform a decrease adjustment to bring the quantity on hand down to zero. Use the quantity on hand as the quantity and the average cost of the item as the unit price. Perform an increase adjustment to bring the quantity back to the previous level. Use the revalued average cost as the unit price for the item. Conversion balances - Importing the overall value of the inventory asset with the rest of the organisation’s chart of accounts and conversion balances. Individual items - Importing the individual quantities and values of each inventory item. For simplicity I’ve only done one inventory item but you can do multiple on the same invoice. And the inventory item has now been updated with quantity on hand, average cost and total value. The opening balance transaction shows in the recent transactions. The last thing to do is some tidy-up. 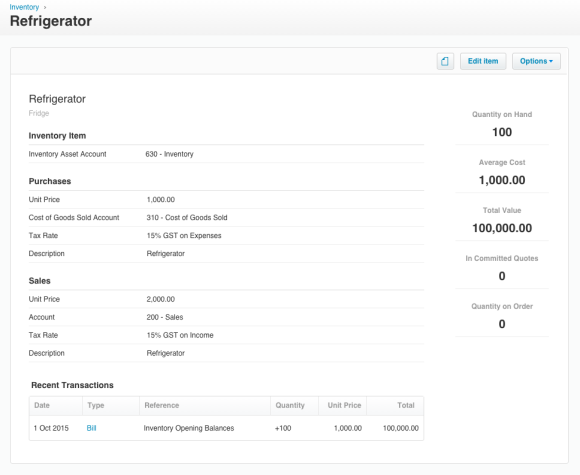 The invoice has created a new contact called “Inventory Opening Balances”. We should archive this contact so it’s not used in future. You can read how to archive contacts in our Contacts documentation. We should also archive the “Inventory Asset Account Opening Balance” account because its balance will now be zero and is no longer required.